A study on moon rocks and samples from the Apollo mission show that water on the moon came from the same source as that of water found on Earth. This discovery raises questions on how the Moon is believed to be formed. 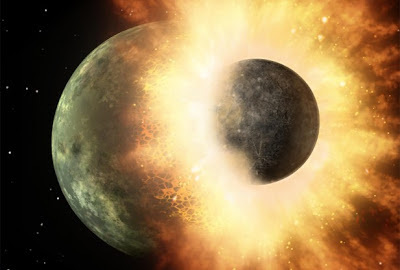 The Great Impact Theory of the formation of the moon involves a planet the size of Mars called Theia colliding with the Earth around 4.5 billion years ago. The debris from the two colliding objects is believed to coalesce and fuse together to form the moon. The Great Impact Theory was first proposed by Reginald Daly of Harvard in 1946 but was not thoroughly discussed until 1974 when Dr. William K. Harmann and Dr. Donald R. Davis brought it up again as a valid explanation of the moon's formation. The theory also would explain the geological and geochemical properties of the moon. With the current research showing that the water found on the moon is from the same source as the Earth's, it is theorized that during the great impact, water already existing on the Earth survived the impact and settled on the moon during its formation. Water inside the Moon's mantle came from primitive meteorites, new research finds, the same source thought to have supplied most of the water on Earth. The findings raise new questions about the process that formed the Moon. The Moon is thought to have formed from a disc of debris left when a giant object hit the Earth 4.5 billion years ago, very early in Earth's history. Scientists have long assumed that the heat from an impact of that size would cause hydrogen and other volatile elements to boil off into space, meaning the Moon must have started off completely dry. But recently, NASA spacecraft and new research on samples from the Apollo missions have shown that the Moon actually has water, both on its surface and beneath. By showing that water on the Moon and on Earth came from the same source, this new study offers yet more evidence that the Moon's water has been there all along. "The simplest explanation for what we found is that there was water on the proto-Earth at the time of the giant impact," said Alberto Saal, associate professor of Geological Sciences at Brown University and the study's lead author. "Some of that water survived the impact, and that's what we see in the Moon." The research was co-authored by Erik Hauri of the Carnegie Institution of Washington, James Van Orman of Case Western Reserve University, and Malcolm Rutherford from Brown and published online in Science Express. To find the origin of the Moon's water, Saal and his colleagues looked at melt inclusions found in samples brought back from the Apollo missions. Melt inclusions are tiny dots of volcanic glass trapped within crystals called olivine. The crystals prevent water escaping during an eruption and enable researchers to get an idea of what the inside of the Moon is like. Research from 2011 led by Hauri found that the melt inclusions have plenty of water — as much water in fact as lavas forming on the Earth's ocean floor. This study aimed to find the origin of that water. To do that, Saal and his colleagues looked at the isotopic composition of the hydrogen trapped in the inclusions. "In order to understand the origin of the hydrogen, we needed a fingerprint," Saal said. "What is used as a fingerprint is the isotopic composition." Using a Cameca NanoSIMS 50L multicollector ion microprobe at Carnegie, the researchers measured the amount of deuterium in the samples compared to the amount of regular hydrogen. Deuterium is an isotope of hydrogen with an extra neutron. Water molecules originating from different places in the solar system have different amounts of deuterium. In general, things formed closer to the sun have less deuterium than things formed farther out. Saal and his colleagues found that the deuterium/hydrogen ratio in the melt inclusions was relatively low and matched the ratio found in carbonaceous chondrites, meteorites originating in the asteroid belt near Jupiter and thought to be among the oldest objects in the solar system. That means the source of the water on the Moon is primitive meteorites, not comets as some scientists thought. Comets, like meteorites, are known to carry water and other volatiles, but most comets formed in the far reaches of the solar system in a formation called the Oort Cloud. Because they formed so far from the sun, they tend to have high deuterium/hydrogen ratios — much higher ratios than in the Moon's interior, where the samples in this study came from. Recent research, Saal said, has found that as much as 98 percent of the water on Earth also comes from primitive meteorites, suggesting a common source for water on Earth and water on Moon. The easiest way to explain that, Saal says, is that the water was already present on the early Earth and was transferred to the Moon. The finding is not necessarily inconsistent with the idea that the Moon was formed by a giant impact with the early Earth, but presents a problem. If the Moon is made from material that came from the Earth, it makes sense that the water in both would share a common source. However, there's still the question of how that water was able to survive such a violent collision. "The impact somehow didn't cause all the water to be lost," Saal said. "But we don't know what that process would be." It suggests, the researchers say, that there are some important processes we don't yet understand about how planets and satellites are formed.